The Holy Disciples from the Seventy: Silas, Sylvanus (Siluanos), Crescentius, Epenetos and Andronikos – were disciples of the Saviour. The Disciple from the Seventy, Saint Silas, was a respected figure in the original Church at Jerusalem, "of the chief men amongst the brethren" (Acts 15: 22). The Council of the Apostles was convened at Jerusalem in the year 51 to deal with the question, whether it be necessary for Christians converted from among the Gentile-pagans to observe the (Old Testament) Mosaic Law [the Law-code contained in the Pentateuch, or Torah, the first five books of the Old Testament]. The Apostles afterwards sent a message with Paul and Barnabas to the Antioch Christians, in which they reported by resolve of the Council, Christians of Gentile-pagan origin were free from having to observe the prescripts of the Mosaic Law. But it was prescribed for them, nonetheless, that they refrain of partaking of foods offered to idols, from things strangled and from blood, to refrain from fornication, and to do naught else than that which be seemly (Acts 15: 20-29). Together with Saints Paul and Barnabas, the Council of the Apostles sent along members of the Jerusalem Church, Saints Silas and Jude, to explain the message in greater detail, since they both were filled with the indwelling grace of the Holy Spirit. Saint Jude thereafter was sent back to Jerusalem, but Saint Silas remained at Antioch and zealously assisted Saint Paul, the Apostle to the Gentiles, on his missionary journeys preaching the Gospel. They visited Syria, Cilicia, Macedonia. In the city of Philippi they were accused of inciting unrest among the people, and for this they were arrested, thrashed with canes, and then thrown into prison. At midnight, when the holy saints were at prayer, suddenly there occurred a strong earthquake, their chains fell off from them and the doors of the prison opened. The prison guard, supposing that the prisoners had fled, wanted to kill himself, but was stopped by the Apostle Paul. Then, all atremble he fell down at the feet of the saints, and with faith accepted their "euangelos" ("good-news") about Christ. He then led them out of the prison and took them to his own home, where he washed their wounds, and was baptised together with all his household. From Philippi Saints Paul and Silas proceeded on to the cities of Amphypolis, Apollonia and Soluneia (Thessalonika). In each city they made new converts to Christ and built up the Church. 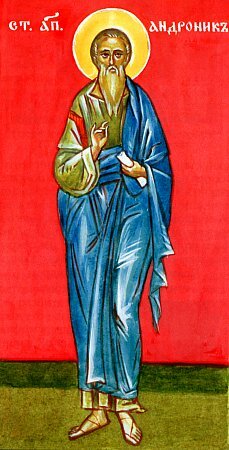 At Corinth the holy Disciple Silas was ordained bishop, and he there worked many a miracle and sign, and there too he finished his life. The Holy Disciple Sylvanus (Siluanos) preached the Word of God together with the chief Apostles Peter and Paul. In his First OEcumenical Epistle, the holy Apostle Peter makes mention of him: "This in brief have I written to ye through Sylvanus, your true brother, I do think..." (1 Pet. 5: 12). Saint Sylvanus was made bishop at Soluneia (Thessalonika) and died there a martyr, having undergone many a sorrow and misfortune for the Lord's sake. About the Holy Disciple Crescentius the holy Apostle Paul makes mention in his Second Epistle to Timothy (2 Tim. 4: 10), saying that Crescentius had gone preaching to Galatia. He was made bishop there, and afterwards he preached the Word of God in Gaul (modern-day France). In the city of Vienna (modern-day Austria) the holy Disciple Crescentius established his student Zacharius as bishop. Having returned to Galatia, he died a martyr under the emperor Trajan (98-117). The Holy Disciple Epenetus was made bishop at Carthage. In his Epistle to the Romans, the holy Apostle Paul writes: "Greet my dear Epenetus, who is from the beginnings in Achaia [alt. Asia] for Christ" (Rom. 16: 5). The Disciple Andronicus is mentioned also in this same Epistle by the Apostle Paul: "Greet Andronicus and Junia [June], my kinsfolk, famed amongst the Apostles and even before me believing in Christ" (Rom. 16: 7). The holy Disciple Andronicus was bishop in Pannonia (modern-day Hungary) (Comm. of Saints Andronicus and Junia is 17 May).